HOTEL ARCADE SHOPS. This sampling of shoppes in hotel arcades highlights the variety of retail commissions undertaken by Adams Design. 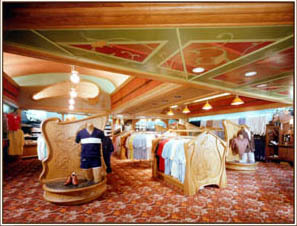 Included here is a mens wear boutique in the Edwardian style with art noveau detailing. Also shown is a charming ice cream parlor in the Victorian style. This was an ode to Princess Liliokalani who was immortalized by Robert Louis Stevenson. The third sampling is an art gallery featuring a grand skylight and cases custom built in "koa" wood  the elegant taper of the legs flair out at the top to create octagonal column tops perfectly suited to support the beveled glass tops of the display cases. ART NOVEAU MENS WEAR SHOP. 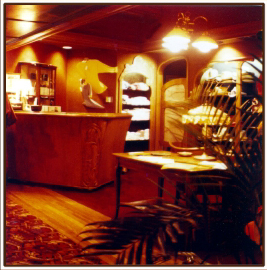 This shop, in the Edwardian style, features custom carved display racks, tables, and cashiers podium, all in exquisite art nouveau retail. The ceiling is hand stenciled to echo the vine pattern in the period carpet. The mid-ceiling is arched and uplit and features a beautifully framed mirror in the "whip lash" curve repeated in the carved elements of all the custom made display pieces. 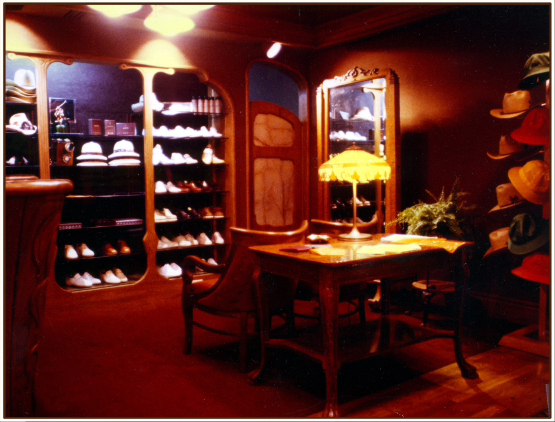 The lighting is theatrical and creates an ambiance of romantic nostalgia. Period reproduction chairs and tables, art and accessories, all added to the visual drama of the art noveau creation.